1. Log in LCSC site and go to BOM Tool on the top menu of the page. 2. 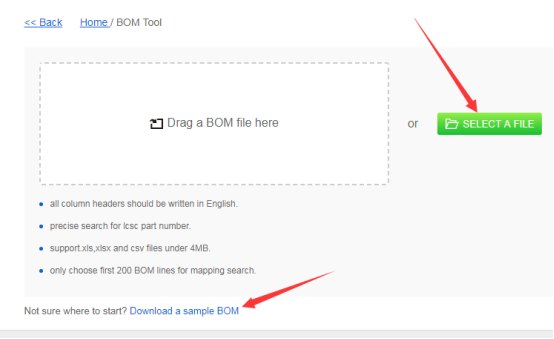 Either click “SELECT A FILE ” to upload the BOM file, or drag a BOM file to the specified zone. We strongly suggest you download a sample BOM form and fill the corresponding column which your wanted parts can be perfect matched. 3. After successfully mapping, you will see the list of all your wanted parts. 4. You can alter the quantity, and see all BOM data by clicking “More”. 5. Once you have added the quantity and saved it to the cart successfully, you can see a tick icon displayed. 6. 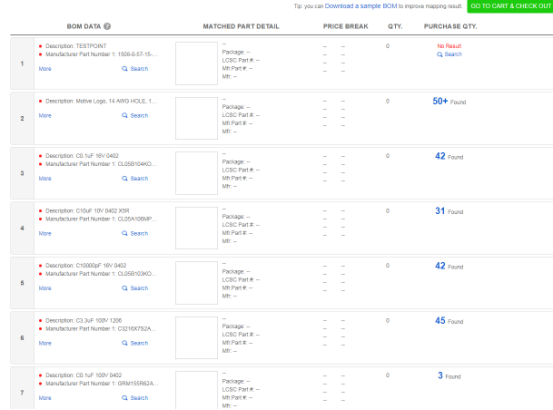 After you have added all wanted parts to the cart and double confirm them, then click check out to have your order processed. *There is another situation that your parts cannot be perfect match, then the page will shows like below after you have mapped the file, you need to manually choose the corresponding parts. that is the reason why we suggest you use our LCSC BOM Sample Template provided to have them precise mapped. 7. You can see there are 5 situations incurred if the file provided is not accurate or match. Note: If the results are found under 50, then our system will automatically show the specific number, or it will list 50+. ① 50+ Found - More than 50 parts found, you need to click it to find the corresponding one. ② Perfect Match - This parts can be matched perfectly. ③ 6 Found - 6 parts found, you need to click it to find the corresponding one. ④ No Result - No related parts found, you need to click it and alter the keywords from the search bar. 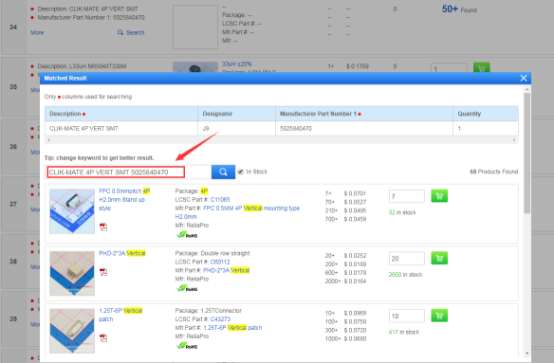 ⑤ Out of stock - Parts not available, click it and alter the keywords from the search bar to find the related one. 8. 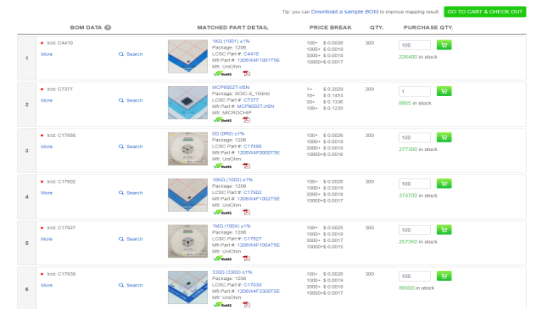 Once you have searched out the parts, added the quantity and saved it to the cart successfully, you can see a tick icon displayed. 9. After you have added all wanted parts to the cart and double confirm them, then click check out to have your order processed. 10. If you have any additional feedback or great ideas, please scroll up and hit the BOM Feedback to let us know, we’d love to hear them.